From best friends to parent and child, significant others or married for 25 years, our selection of couples jewelry has you covered! The close relationships in our life are the most important relationships in our life. From our relationships with our children to the special bonds with our besties to the person that we share our life with, we have custom couple necklaces that help you celebrate the love. Selections range from matching couple jewelry to couples dog tags and more and we can even create a custom piece unique to the two of you! Our specially designed three step guide can assist with narrowing down your choices with relative ease and help you choose the perfect couples jewelry that epitomizes your relationship! The relationship that you are celebrating does play a significant part on the custom couple necklaces that you choose. We’ve broken it down into three basic types of relationships: family relationships, friend relationships, significant other relationships. 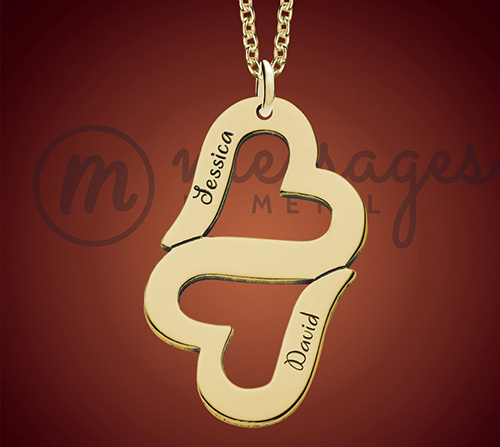 We are all about family and no matter if it’s a father daughter relationship, that special bond between a mother and son or the relationship amongst siblings, there is a couple name necklace that will commemorate that connection. 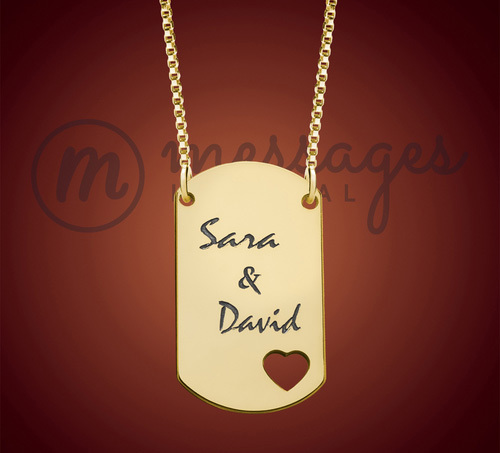 Couple dog tags such as the My Heart Belongs To is ideal for a parent and child and provides a beautiful way to show your love for one another. The My Heart Belongs To includes two distinct pendants and each comes with it’s own chain. Those besties in our life, our ride and die’s, our go-to’s for support - there is nothing like them! Our custom couple necklaces include styles like the Everlasting Tag Necklace and each half of the whole couple gets their own individual necklace. Custom design them with one another’s name, choose the finish that appeals to you the most and honor that unique relationship that is unlike any other. No matter if you’re a boyfriend or girlfriend, in a long term relationship or married for several years, we are all about feeling the love! A couple heart necklace is a great way to show the love for that love and the styles are far reaching. We have Hearts Connected pendants, Heart in My Heart couples jewelry and each of them can be personalized with a name and, in some cases, a birthstone of your choice. 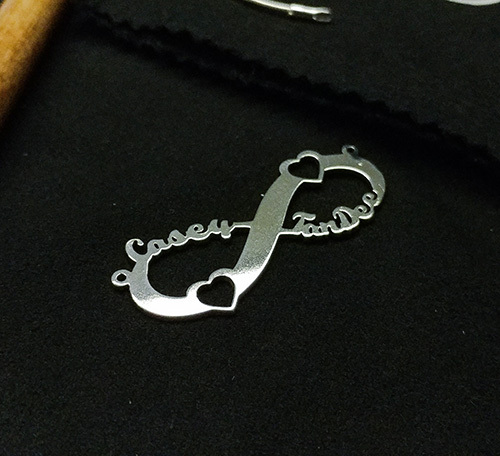 Infinity personalized couple necklaces are available with and without Swarovski heart stones and create a visual reminder of the infinite bond between two people that love each other. Our couples jewelry has styles that are sold together, allowing for each recipient to have an individual pendant, and styles that are sold as one piece where only one recipient would wear. Be aware ahead of time if you’re looking for something in multiples or a single necklace to celebrate the relationship. Our lifestyles vary greatly from person to person. Some of us lead very active lives, are constantly on the go while others take a more laid back approach to their days. Some of us are super conservative while others - the more bling the better! Keep in mind the lifestyle of the recipient when choosing couples jewelry and this will help you to zone in on exactly what will appeal to them the most. For those that are active, we’ve got some great custom couple necklaces for you to choose from! Styles such as the Together Bar Necklace sit closer to the base of the throat and are less likely to bounce around during any sort of athletic activity. The Infinity style custom couple jewelry is another great option because of the way in which the pendant is designed - more of a horizontal pendant versus vertical. For those that lead a more laid back, less vigorous lifestyle, we’ve got several selections for you to choose from for matching couple jewelry. Name Tag styles such as the Heartbeat are vertically designed and sit a bit lower on the chest. Dog tag pendants like the Together Forever have a little more weight to the pendant and again, are more of a vertical design and sit lower than the base of the throat. If you are looking for love necklaces for couples that lean more towards the conservative, we can take care of it. Understated elegance at its finest, couples jewelry such as the Together Name Necklace combine the two names that you choose on a standard bar. 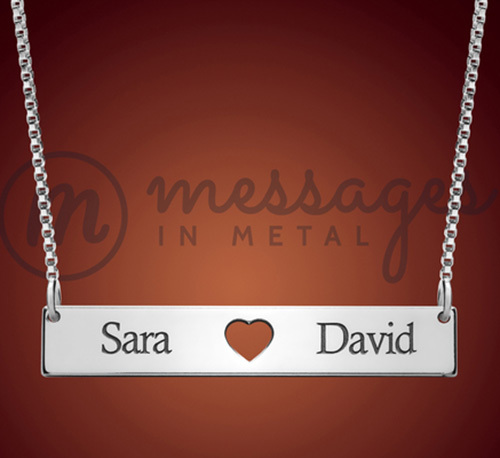 Most of our personalized couple necklaces are available in sterling silver and 24k gold plated over sterling silver, making for an each choice for those that take a conservative approach. And we love our love necklaces for couples that embrace the more extravagant lifestyle! Beautiful name necklaces such as the Heart in My Heart are accented with birthstones and add a bit of color and bling to the side by side hearts. 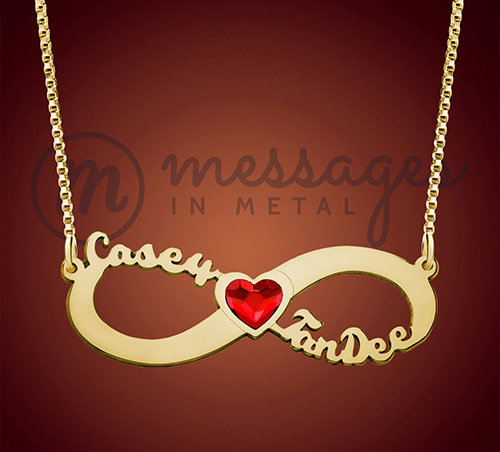 Other styles such as the Infinity Name Necklace are available with a Swarovski heart at the center and add great depth and dimension to the jewelry. In addition to being available in sterling silver and 24k gold plated, we offer antique silver on many of our couples jewelry and we can even do rose gold plated upon request. 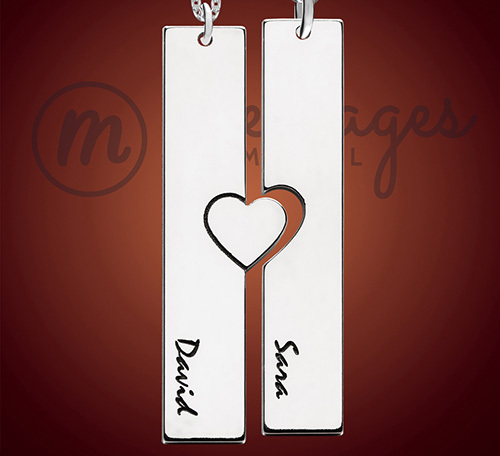 When it comes to choose custom couples necklaces, it is important to make it personal. You are showing your love for a special relationship in your life and your selection should reflect that. Look at the font selections available with custom couple jewelry and think about what appeals to you. Choose a style that you connect with. 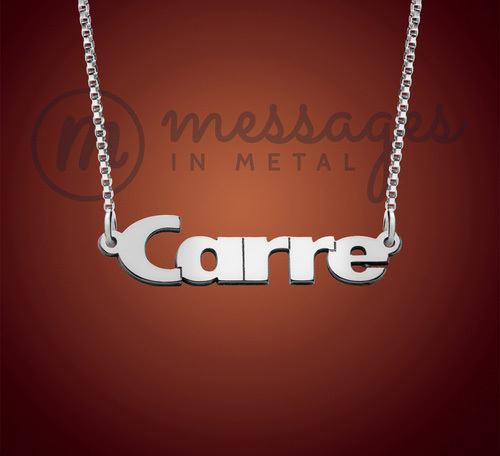 Often times women prefer rounded text such as our Charming Name Necklace while men often times connect with a simpler bolder style like the Confidence Name Necklace. Find a font that you find overall appealing visually and stick with that style. This can go either way and is a personal decision when it comes to selection couples jewelry for a significant other. You may want to go the direction of choosing what you feel will be most appealing for them. Many people are very specific about the type and style of jewelry they prefer and even if it comes from the heart, you may miss the mark if you stray too far from what they are comfortable with. On the other hand, it’s okay to choose a couple name necklace that reminds you of your significant other. Maybe the font selection reminds you of their handwriting or perhaps although they are a little more conservative, you choose your birthstone to accent the couples jewelry. There’s no right or wrong answer - just be sure to weigh it out and explore all of your options. If you are buying couples jewelry for a couple, choose your personalized pieces carefully. Keep in mind the age of the recipients. For instance, if you’re buying for teens, you may want to lean towards something conservative such as a dog tag style. If looking for a couple that is established and has been together for a significant period of time, pay careful attention to their lifestyle. Pendants that are two in one such as the Everlasting are a great option for matching necklaces for couples in this instance. Choosing personalized couple necklaces is not an easy task - especially when it is recognizing one of the most special of all relationships. Shop now and see our great selection of couples jewelry or let us help you design your own custom piece!